Cameroon’s online community has reacted ‘negatively’ to President Biya’s message in which he called on the citizens of Cameroon to be patriotic, by not joining and relaying messages from critics of his regime. 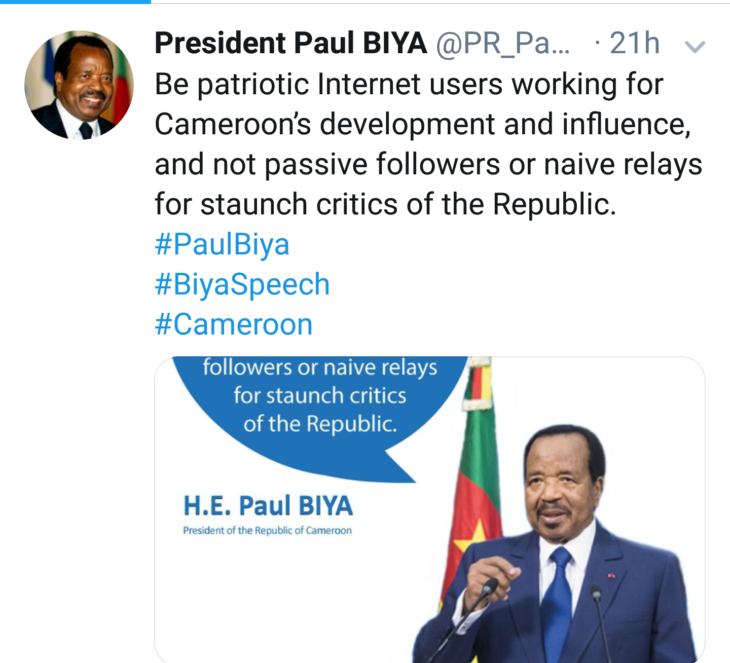 Friday, February 8, President Paul Biya who has been in power for close to four decades, twitted “be patriotic internet users working for Cameroon’s development and influence,” he said, adding; “and not passive followers or naïve relays for staunch critics of the Republic”. This message from the President of Cameroon has captured criticism from Cameroonians in and out of the country who say they are disappointed with their leaders. Lanjo Fopa Alexandre commented on Biya’s official Facebook account, saying “we love Cameroon and not our leaders. They are so egoistic without conscience”. The president is calling on Cameroonians to be patriotic internet users at a time that many youths are been influenced on social media to protest and revolt against the system. Weeks ago, some political parties protested by saying ‘no to electoral hold-ups’ in Cameroon, and that is what Ayuk Jones in frowning at “you should start to show us patriotism by not rigging elections and respect our human dignity as Cameroonians” He said, directing his message to Biya. The president has in several cases ordered for internet to be disconnected in other parts of the country because he believed the people were been influenced online by those who want to destabilise the country. Now, Cameroon is currently facing a crisis in the Anglophones regions and what some people have started referring to as the Francophone crisis in the French Zones of Cameroon. Most Cameroonians according to some critics have lost trust in the system and that is why they tend to accept whatever thing is said about the regime on social media by those who want to see its downfall. Being patriotic does not mean telling lies,regging elections, corrupting fellow citizens’ minds and selling our consciences to support a particular individual and an oligarchic regime in power. It’s a shame you don’t have a donate button! I’d without a doubt donate to this excellent blog! I guess for now i’ll settle for book-marking and adding your RSS feed to my Google account. I look forward to brand new updates and will share this site with my Facebook group. Talk soon! I just want to tell you that I am all new to weblog and absolutely savored this blog site. Likely I’m want to bookmark your site . You certainly have really good well written articles. Appreciate it for sharing your web page. My husband and i got now delighted that Louis could finish up his web research from your ideas he discovered from your web page. It is now and again perplexing to just possibly be freely giving information which usually a number of people may have been trying to sell. And now we do understand we have got the blog owner to appreciate for this. The type of explanations you have made, the easy website menu, the relationships your site give support to instill – it’s got mostly sensational, and it’s really making our son in addition to the family know that this issue is pleasurable, which is really serious. Thank you for the whole lot! I needed to send you the bit of note to finally say thanks a lot yet again just for the exceptional basics you’ve shared here. It was quite seriously open-handed with you to provide without restraint what exactly most of us would’ve sold as an ebook to end up making some money for themselves, notably considering the fact that you could have tried it if you ever decided. Those techniques in addition acted to become a easy way to know that most people have the identical keenness the same as my very own to find out a whole lot more with regards to this matter. I am sure there are numerous more enjoyable periods up front for people who look into your blog. Needed to put you the very small note to be able to thank you very much over again considering the marvelous advice you have documented above. This is certainly shockingly generous of people like you giving publicly just what most of us would have advertised for an e book to get some cash for their own end, chiefly considering the fact that you might well have done it in the event you considered necessary. Those strategies likewise acted like a great way to recognize that most people have similar interest the same as my own to find out way more pertaining to this problem. I know there are some more fun moments up front for those who look into your blog. I precisely wanted to thank you very much again. I’m not certain what I would’ve carried out in the absence of the actual strategies documented by you over that subject. This was an absolute daunting situation for me, nevertheless discovering a new professional style you solved the issue took me to cry with fulfillment. I am just thankful for this guidance as well as have high hopes you realize what a powerful job you’re getting into educating other individuals thru your web page. I’m certain you haven’t got to know all of us. I have to express some thanks to the writer for rescuing me from this challenge. As a result of checking through the the net and obtaining tricks which are not productive, I thought my entire life was done. Being alive devoid of the answers to the difficulties you have fixed all through your entire posting is a crucial case, and ones that might have negatively affected my entire career if I hadn’t come across your web site. Your primary skills and kindness in taking care of every part was tremendous. I don’t know what I would’ve done if I hadn’t discovered such a solution like this. It’s possible to at this moment look forward to my future. Thanks a lot so much for your skilled and sensible guide. I will not be reluctant to refer your web sites to any person who would like guide on this area. Thanks a lot for providing individuals with remarkably spectacular opportunity to check tips from this site. It’s usually very nice and packed with fun for me and my office co-workers to search your web site at the least thrice weekly to learn the fresh guides you have. And definitely, I am also certainly happy with all the striking guidelines served by you. Selected 2 areas in this posting are honestly the most efficient we’ve ever had. I¡¦ll immediately grasp your rss as I can not in finding your email subscription hyperlink or newsletter service. Do you’ve any? Kindly permit me know so that I may subscribe. Thanks. Thank you so much for giving everyone a very breathtaking opportunity to check tips from this web site. It can be so beneficial plus stuffed with a good time for me personally and my office fellow workers to visit your website at a minimum 3 times in a week to see the new issues you have. And definitely, we’re actually motivated with the striking methods you serve. Certain 1 points on this page are without a doubt the finest I have ever had. Simply wish to say your article is as surprising. The clearness in your post is simply great and i can assume you’re an expert on this subject. Well with your permission allow me to grab your RSS feed to keep up to date with forthcoming post. Thanks a million and please continue the rewarding work. Thanks a bunch for sharing this with all folks you actually recognise what you are speaking about! Bookmarked. Kindly also seek advice from my website =). We can have a hyperlink trade contract among us! It¡¦s actually a cool and useful piece of info. I¡¦m happy that you simply shared this useful information with us. Please keep us up to date like this. Thank you for sharing. I must show some thanks to this writer for bailing me out of this type of incident. After surfing around through the internet and obtaining views which were not powerful, I assumed my life was well over. Living minus the answers to the difficulties you have sorted out through your main review is a critical case, and the ones which might have in a negative way affected my career if I hadn’t discovered your web page. The skills and kindness in dealing with almost everything was excellent. I don’t know what I would’ve done if I hadn’t discovered such a step like this. I can also now look ahead to my future. Thanks for your time so much for your professional and effective guide. I won’t be reluctant to recommend the website to anybody who needs and wants counselling on this situation. A lot of thanks for all of the efforts on this blog. My aunt take interest in participating in research and it’s really easy to understand why. A number of us know all relating to the lively mode you convey reliable information on the web site and as well as foster contribution from the others on that content and our own daughter is in fact being taught a lot of things. Take pleasure in the rest of the year. You are always conducting a really good job. I¡¦ve been exploring for a bit for any high quality articles or weblog posts on this kind of space . Exploring in Yahoo I ultimately stumbled upon this website. Reading this info So i am happy to express that I’ve a very excellent uncanny feeling I came upon exactly what I needed. I such a lot unquestionably will make sure to do not overlook this web site and give it a look regularly. I wanted to compose you the little word in order to give thanks the moment again relating to the lovely things you have contributed above. It was really strangely open-handed with you to deliver easily just what many of us might have marketed as an e-book in making some money on their own, specifically seeing that you might well have tried it if you ever considered necessary. These solutions additionally acted as a good way to be sure that other people online have the same keenness the same as mine to understand whole lot more in terms of this condition. I think there are several more fun periods in the future for people who read through your blog. I¡¦m now not certain the place you are getting your information, but good topic. I needs to spend a while finding out more or understanding more. Thank you for excellent info I used to be looking for this information for my mission. Nice post. I was checking continuously this blog and I am impressed! Very helpful information specifically the last part 🙂 I care for such info a lot. I was seeking this particular information for a long time. Thank you and good luck. I would like to thnkx for the efforts you have put in writing this site. I’m hoping the same high-grade site post from you in the upcoming also. In fact your creative writing skills has encouraged me to get my own website now. Really the blogging is spreading its wings fast. Your write up is a good example of it. I in addition to my buddies appeared to be going through the best procedures from your site while then developed a terrible feeling I had not thanked the web blog owner for those techniques. Those women were definitely consequently joyful to read through them and have in effect seriously been having fun with them. I appreciate you for indeed being indeed accommodating and for choosing variety of amazing themes millions of individuals are really eager to understand about. Our sincere regret for not saying thanks to sooner. I wish to express my appreciation to this writer just for rescuing me from this type of challenge. Because of surfing through the search engines and coming across ideas which are not helpful, I figured my life was gone. Being alive without the presence of answers to the issues you’ve fixed all through the short post is a serious case, as well as the ones that would have adversely affected my entire career if I had not encountered your web site. Your good skills and kindness in dealing with every aspect was tremendous. I don’t know what I would have done if I hadn’t come across such a point like this. I can also at this moment relish my future. Thank you so much for this specialized and results-oriented help. I won’t think twice to propose the blog to anybody who will need tips on this area. I simply want to tell you that I am just new to blogging and actually loved this web site. Most likely I’m planning to bookmark your site . You amazingly have exceptional articles and reviews. Kudos for sharing with us your blog site. I simply had to appreciate you once again. I do not know what I would have implemented without those basics discussed by you regarding my subject matter. It became a real scary situation for me, nevertheless observing the professional way you processed it made me to cry with joy. I’m just happier for your assistance and then hope that you really know what an amazing job that you’re providing educating other individuals using your websites. More than likely you’ve never got to know all of us. My husband and i felt now ecstatic that Chris managed to conclude his reports out of the ideas he grabbed from your web pages. It is now and again perplexing just to be making a gift of steps that other people might have been making money from. We acknowledge we now have the writer to be grateful to because of that. All of the explanations you made, the straightforward blog navigation, the friendships you will aid to promote – it is most excellent, and it’s really making our son and us reckon that that topic is exciting, which is certainly unbelievably serious. Many thanks for all the pieces! Normally I don’t learn article on blogs, but I wish to say that this write-up very forced me to take a look at and do it! Your writing taste has been surprised me. Thank you, quite great article. My wife and i ended up being absolutely cheerful Peter managed to do his preliminary research using the precious recommendations he grabbed in your weblog. It’s not at all simplistic to simply possibly be releasing techniques some other people might have been making money from. And we also see we have got the blog owner to be grateful to for that. The entire explanations you have made, the simple website navigation, the relationships you help engender – it is everything excellent, and it’s making our son and our family know that this content is awesome, and that is very fundamental. Thank you for all the pieces! I would like to thank you for the efforts you’ve put in writing this site. I’m hoping the same high-grade site post from you in the upcoming as well. Actually your creative writing skills has encouraged me to get my own website now. Actually the blogging is spreading its wings quickly. Your write up is a great example of it. It¡¦s really a cool and useful piece of information. I¡¦m glad that you simply shared this useful information with us. Please stay us informed like this. Thanks for sharing. Very well written article. It will be helpful to everyone who employess it, as well as yours truly :). Keep doing what you are doing – for sure i will check out more posts. Great post. I was checking continuously this blog and I am impressed! Very useful information specially the last part 🙂 I care for such info a lot. I was seeking this certain information for a long time. Thank you and good luck. Hi, Neat post. There is a problem with your website in web explorer, might check this¡K IE nonetheless is the market leader and a large portion of folks will pass over your excellent writing due to this problem. Hiya, I’m really glad I’ve found this info. Today bloggers publish just about gossips and net and this is actually irritating. A good blog with exciting content, that is what I need. Thanks for keeping this web-site, I’ll be visiting it. Do you do newsletters? Cant find it. I would like to thank you for the efforts you’ve put in writing this blog. I’m hoping the same high-grade website post from you in the upcoming also. Actually your creative writing abilities has inspired me to get my own site now. Really the blogging is spreading its wings quickly. Your write up is a great example of it. Hello there. I discovered your web site by means of Google whilst looking for a related topic, your site got here up. It appears great. I have bookmarked it in my google bookmarks to visit then. magnificent points altogether, you just received a new reader. What could you recommend about your put up that you made a few days in the past? Any positive? I would like to thnkx for the efforts you’ve put in writing this website. I am hoping the same high-grade website post from you in the upcoming also. Actually your creative writing skills has encouraged me to get my own web site now. Really the blogging is spreading its wings rapidly. Your write up is a good example of it. Hiya, I am really glad I have found this information. Nowadays bloggers publish just about gossips and web and this is really annoying. A good website with exciting content, this is what I need. Thanks for keeping this web-site, I’ll be visiting it. Do you do newsletters? Can not find it. Hello.This article was really fascinating, especially because I was investigating for thoughts on this matter last Wednesday. Hiya, I’m really glad I have found this info. Nowadays bloggers publish just about gossip and internet stuff and this is really irritating. A good website with exciting content, that’s what I need. Thanks for making this web-site, and I’ll be visiting again. Do you do newsletters by email? I¡¦ve learn several just right stuff here. Certainly value bookmarking for revisiting. I wonder how much attempt you place to make such a magnificent informative website. A person essentially help to make severely posts I’d state. That is the first time I frequented your website page and up to now? I surprised with the analysis you made to make this actual post incredible. Excellent process! Hiya, I’m really glad I’ve found this info. Nowadays bloggers publish just about gossip and internet stuff and this is actually frustrating. A good website with interesting content, this is what I need. Thanks for making this website, and I will be visiting again. Do you do newsletters by email? I want to voice my admiration for your kind-heartedness giving support to men and women who require assistance with this important theme. Your special commitment to passing the solution up and down appears to be incredibly useful and has specifically helped guys and women just like me to achieve their ambitions. Your useful help and advice means a lot a person like me and further more to my peers. Thanks a ton; from all of us. Hiya, I’m really glad I’ve found this info. Nowadays bloggers publish only about gossip and web stuff and this is really annoying. A good web site with exciting content, that’s what I need. Thank you for making this web site, and I will be visiting again. Do you do newsletters by email? Hey there. I found your website by the use of Google at the same time as searching for a comparable subject, your web site got here up. It seems to be good. I have bookmarked it in my google bookmarks to come back then. Hiya, I am really glad I’ve found this info. Today bloggers publish just about gossip and net stuff and this is really annoying. A good blog with exciting content, that’s what I need. Thanks for making this website, and I will be visiting again. Do you do newsletters by email? Hiya, I’m really glad I’ve found this info. Today bloggers publish only about gossips and net and this is really annoying. A good site with interesting content, that is what I need. Thank you for keeping this website, I’ll be visiting it. Do you do newsletters? Cant find it. Hi there. I found your website via Google even as searching for a similar topic, your site came up. It seems great. I’ve bookmarked it in my google bookmarks to come back then. Hiya, I am really glad I have found this info. Nowadays bloggers publish only about gossip and net stuff and this is actually frustrating. A good site with interesting content, that’s what I need. Thank you for making this website, and I’ll be visiting again. Do you do newsletters by email? Hiya, I’m really glad I’ve found this info. Today bloggers publish just about gossip and net stuff and this is really annoying. A good website with exciting content, that’s what I need. Thanks for making this web-site, and I will be visiting again. Do you do newsletters by email? Hey there. I found your website by means of Google even as looking for a comparable matter, your web site came up. It appears to be good. I have bookmarked it in my google bookmarks to visit then. Hi there. I discovered your web site by means of Google even as searching for a similar matter, your web site came up. It seems great. I’ve bookmarked it in my google bookmarks to visit then. Thank you a lot for providing individuals with such a remarkable chance to read critical reviews from this blog. It can be so pleasurable plus jam-packed with a good time for me and my office mates to search your website at the least 3 times weekly to read the new issues you will have. And of course, I am just always motivated considering the excellent tips served by you. Certain two tips in this article are rather the most effective we have all ever had. I am just commenting to make you understand of the awesome encounter my child encountered viewing your web site. She came to understand numerous details, with the inclusion of what it’s like to possess an excellent giving nature to let a number of people quite simply grasp a number of very confusing subject matter. You actually surpassed her expected results. I appreciate you for offering these beneficial, trustworthy, explanatory and also unique thoughts on this topic to Tanya. Hiya, I am really glad I’ve found this info. Nowadays bloggers publish only about gossips and web and this is actually annoying. A good website with interesting content, this is what I need. Thank you for keeping this web-site, I will be visiting it. Do you do newsletters? Cant find it. Hiya, I am really glad I’ve found this info. Today bloggers publish just about gossip and internet stuff and this is really irritating. A good web site with exciting content, this is what I need. Thanks for making this web-site, and I’ll be visiting again. Do you do newsletters by email? Hi there. I found your blog by the use of Google while looking for a related topic, your website got here up. It appears great. I have bookmarked it in my google bookmarks to come back then. Hiya, I am really glad I have found this information. Nowadays bloggers publish just about gossip and net stuff and this is actually irritating. A good website with exciting content, this is what I need. Thank you for making this web site, and I will be visiting again. Do you do newsletters by email? Hiya, I am really glad I have found this information. Today bloggers publish just about gossip and web stuff and this is actually frustrating. A good website with interesting content, that is what I need. Thank you for making this web site, and I will be visiting again. Do you do newsletters by email? Hiya, I am really glad I’ve found this info. Nowadays bloggers publish only about gossip and web stuff and this is really frustrating. A good blog with interesting content, this is what I need. Thanks for making this site, and I’ll be visiting again. Do you do newsletters by email? Hey there. I discovered your blog by way of Google at the same time as searching for a similar subject, your website got here up. It looks good. I have bookmarked it in my google bookmarks to visit then. Hiya, I am really glad I’ve found this info. Nowadays bloggers publish just about gossip and web stuff and this is really annoying. A good site with interesting content, this is what I need. Thanks for making this website, and I’ll be visiting again. Do you do newsletters by email? Hey there. I discovered your site via Google at the same time as looking for a similar matter, your website came up. It seems good. I have bookmarked it in my google bookmarks to come back then. rxofnmu,If you have any struggle to download KineMaster for PC just visit this site. Hello there. I discovered your blog by means of Google whilst looking for a related subject, your site came up. It looks great. I’ve bookmarked it in my google bookmarks to come back then. Hiya, I’m really glad I have found this info. Nowadays bloggers publish just about gossip and internet stuff and this is actually irritating. A good web site with interesting content, that is what I need. Thank you for making this web-site, and I’ll be visiting again. Do you do newsletters by email? Hiya, I am really glad I have found this information. Today bloggers publish only about gossip and net stuff and this is actually frustrating. A good website with interesting content, that is what I need. Thank you for making this web site, and I will be visiting again. Do you do newsletters by email? Thanks for your whole labor on this web page. Betty loves setting aside time for research and it’s really obvious why. I know all regarding the compelling means you provide both useful and interesting suggestions by means of this website and as well boost response from some other people on the topic so my child has always been being taught so much. Take pleasure in the remaining portion of the new year. Your doing a brilliant job. Hi there. I found your web site by way of Google at the same time as searching for a comparable matter, your web site came up. It seems good. I’ve bookmarked it in my google bookmarks to visit then. Hiya, I’m really glad I have found this information. Today bloggers publish just about gossip and net stuff and this is actually irritating. A good blog with exciting content, that is what I need. Thanks for making this web-site, and I will be visiting again. Do you do newsletters by email? Hiya, I am really glad I have found this information. Nowadays bloggers publish only about gossip and internet stuff and this is really frustrating. A good blog with interesting content, that is what I need. Thanks for making this web site, and I will be visiting again. Do you do newsletters by email? Hello there. I found your web site by the use of Google even as looking for a comparable matter, your website got here up. It appears to be good. I’ve bookmarked it in my google bookmarks to visit then. Hiya, I’m really glad I have found this info. Today bloggers publish just about gossip and internet stuff and this is actually irritating. A good blog with exciting content, that is what I need. Thanks for making this web site, and I’ll be visiting again. Do you do newsletters by email? Hiya, I am really glad I have found this information. Nowadays bloggers publish only about gossip and internet stuff and this is really frustrating. A good web site with exciting content, this is what I need. Thanks for making this website, and I will be visiting again. Do you do newsletters by email? Hello there. I found your blog by way of Google while searching for a related subject, your site got here up. It looks good. I’ve bookmarked it in my google bookmarks to visit then. Hiya, I am really glad I have found this information. Nowadays bloggers publish only about gossip and internet stuff and this is actually annoying. A good web site with interesting content, that is what I need. Thanks for making this web site, and I’ll be visiting again. Do you do newsletters by email? Hiya, I am really glad I have found this information. Nowadays bloggers publish just about gossip and net stuff and this is really annoying. A good site with interesting content, that is what I need. Thank you for making this website, and I’ll be visiting again. Do you do newsletters by email? Hey there. I discovered your web site via Google while looking for a similar matter, your website got here up. It seems good. I’ve bookmarked it in my google bookmarks to visit then. Hi there. I discovered your website by the use of Google even as looking for a related matter, your website got here up. It looks great. I’ve bookmarked it in my google bookmarks to come back then. Hiya, I am really glad I’ve found this info. Today bloggers publish only about gossip and internet stuff and this is really irritating. A good web site with interesting content, this is what I need. Thanks for making this web-site, and I’ll be visiting again. Do you do newsletters by email? Hi there. I found your website by way of Google even as searching for a comparable subject, your site got here up. It seems good. I have bookmarked it in my google bookmarks to come back then. Hiya, I am really glad I’ve found this info. Nowadays bloggers publish only about gossip and web stuff and this is really annoying. A good blog with interesting content, that’s what I need. Thank you for making this web-site, and I’ll be visiting again. Do you do newsletters by email? Hi there. I discovered your website by way of Google whilst looking for a comparable topic, your web site got here up. It seems good. I have bookmarked it in my google bookmarks to visit then. Hey there. I discovered your site via Google even as looking for a similar topic, your site came up. It seems good. I’ve bookmarked it in my google bookmarks to visit then. Hiya, I’m really glad I’ve found this info. Nowadays bloggers publish just about gossip and internet stuff and this is actually irritating. A good web site with interesting content, this is what I need. Thank you for making this site, and I will be visiting again. Do you do newsletters by email? Hi there. I found your blog by the use of Google while looking for a comparable topic, your website came up. It appears great. I have bookmarked it in my google bookmarks to visit then. Hiya, I am really glad I have found this information. Today bloggers publish only about gossip and net stuff and this is really irritating. A good blog with interesting content, that is what I need. Thank you for making this website, and I’ll be visiting again. Do you do newsletters by email? Nice post. I was checking continuously this blog and I am impressed! Extremely useful information specifically the last part 🙂 I care for such information a lot. I was seeking this particular info for a long time. Thank you and best of luck. Hi there. I discovered your web site via Google while searching for a similar matter, your web site got here up. It seems to be great. I’ve bookmarked it in my google bookmarks to come back then. Hiya, I’m really glad I have found this information. Nowadays bloggers publish only about gossip and internet stuff and this is really annoying. A good web site with interesting content, that is what I need. Thanks for making this web site, and I will be visiting again. Do you do newsletters by email? Hiya, I’m really glad I have found this information. Today bloggers publish only about gossip and web stuff and this is really irritating. A good site with interesting content, this is what I need. Thank you for making this website, and I will be visiting again. Do you do newsletters by email? Hello there. I found your site via Google at the same time as looking for a related topic, your website got here up. It appears great. I’ve bookmarked it in my google bookmarks to come back then. Hiya, I’m really glad I have found this info. Today bloggers publish just about gossip and internet stuff and this is actually frustrating. A good website with exciting content, that is what I need. Thank you for making this web site, and I will be visiting again. Do you do newsletters by email? Magnificent website. A lot of useful information here. I¡¦m sending it to several buddies ans additionally sharing in delicious. And certainly, thanks for your effort! Hello there. I found your blog via Google even as looking for a comparable matter, your web site got here up. It appears to be great. I’ve bookmarked it in my google bookmarks to visit then. Hi there. I discovered your web site by means of Google while looking for a comparable matter, your site came up. It looks good. I have bookmarked it in my google bookmarks to come back then. Hi there. I found your website by way of Google whilst looking for a related matter, your website got here up. It appears good. I have bookmarked it in my google bookmarks to visit then. Hey there. I found your website by way of Google at the same time as looking for a similar subject, your website came up. It looks good. I’ve bookmarked it in my google bookmarks to come back then. Hi there. I found your blog by means of Google even as searching for a related subject, your web site came up. It seems great. I’ve bookmarked it in my google bookmarks to come back then. Hiya, I’m really glad I have found this info. Today bloggers publish just about gossip and web stuff and this is actually annoying. A good website with exciting content, that is what I need. Thank you for making this web site, and I’ll be visiting again. Do you do newsletters by email? Hi there. I found your site via Google at the same time as searching for a similar subject, your web site came up. It looks great. I’ve bookmarked it in my google bookmarks to visit then. Hiya, I am really glad I have found this information. Today bloggers publish only about gossip and net stuff and this is really annoying. A good web site with interesting content, that’s what I need. Thank you for making this site, and I will be visiting again. Do you do newsletters by email? Hey there. I discovered your website by means of Google while looking for a comparable matter, your website got here up. It appears good. I’ve bookmarked it in my google bookmarks to visit then. Hiya, I am really glad I’ve found this info. Today bloggers publish only about gossip and web stuff and this is actually frustrating. A good blog with exciting content, this is what I need. Thank you for making this web site, and I’ll be visiting again. Do you do newsletters by email? Hiya, I am really glad I’ve found this information. Today bloggers publish just about gossip and web stuff and this is really annoying. A good web site with exciting content, that is what I need. Thank you for making this web-site, and I will be visiting again. Do you do newsletters by email? Hiya, I am really glad I’ve found this information. Nowadays bloggers publish only about gossip and web stuff and this is really irritating. A good site with exciting content, this is what I need. Thank you for making this site, and I’ll be visiting again. Do you do newsletters by email? I’m still learning from you, as I’m making my way to the top as well. I absolutely love reading everything that is posted on your site.Keep the stories coming. I loved it! Magnificent website. A lot of helpful information here. I am sending it to a few friends ans also sharing in delicious. And naturally, thank you for your sweat! Great amazing issues here. I am very satisfied to peer your post. Thanks so much and i am having a look ahead to touch you. Will you please drop me a e-mail? Hello there. I discovered your blog via Google at the same time as looking for a similar topic, your web site came up. It looks great. I’ve bookmarked it in my google bookmarks to visit then. I do agree with all of the ideas you have introduced on your post. They’re really convincing and will definitely work. Still, the posts are very quick for novices. May just you please prolong them a bit from subsequent time? Thank you for the post. Hiya, I am really glad I’ve found this information. Today bloggers publish just about gossip and web stuff and this is actually annoying. A good site with interesting content, that’s what I need. Thank you for making this web site, and I’ll be visiting again. Do you do newsletters by email? Hey there. I discovered your web site by means of Google whilst looking for a related matter, your website came up. It appears great. I have bookmarked it in my google bookmarks to visit then. Hiya, I’m really glad I have found this info. Nowadays bloggers publish just about gossip and web stuff and this is actually annoying. A good website with interesting content, that’s what I need. Thank you for making this site, and I will be visiting again. Do you do newsletters by email? Hello there. I found your blog by means of Google while searching for a similar topic, your website came up. It appears great. I’ve bookmarked it in my google bookmarks to come back then. Hiya, I am really glad I have found this information. Today bloggers publish just about gossip and web stuff and this is really irritating. A good site with interesting content, that is what I need. Thank you for making this website, and I will be visiting again. Do you do newsletters by email? Hiya, I am really glad I’ve found this information. Nowadays bloggers publish just about gossip and net stuff and this is actually frustrating. A good blog with exciting content, this is what I need. Thank you for making this website, and I will be visiting again. Do you do newsletters by email? Thank you a lot for providing individuals with remarkably memorable chance to read from this blog. It can be so fantastic and full of fun for me personally and my office friends to visit your blog the equivalent of three times per week to read the newest secrets you have. And of course, I am also certainly pleased considering the effective creative ideas you give. Selected 3 ideas in this posting are indeed the simplest we’ve ever had. Hiya, I’m really glad I’ve found this information. Nowadays bloggers publish only about gossip and web stuff and this is actually annoying. A good website with interesting content, this is what I need. Thanks for making this web-site, and I’ll be visiting again. Do you do newsletters by email? Hey there. I discovered your web site via Google at the same time as searching for a similar topic, your website came up. It seems to be great. I have bookmarked it in my google bookmarks to come back then. I just want to tell you that I am just very new to blogging and site-building and definitely loved you’re web-site. Almost certainly I’m want to bookmark your website . You absolutely have excellent well written articles. Appreciate it for sharing with us your blog site. Hiya, I’m really glad I have found this information. Nowadays bloggers publish only about gossip and web stuff and this is really irritating. A good web site with interesting content, that’s what I need. Thanks for making this web site, and I will be visiting again. Do you do newsletters by email? Hiya, I’m really glad I’ve found this info. Today bloggers publish just about gossip and internet stuff and this is really frustrating. A good web site with interesting content, that is what I need. Thank you for making this web site, and I will be visiting again. Do you do newsletters by email? Hey there. I found your blog via Google whilst looking for a related topic, your website came up. It seems good. I’ve bookmarked it in my google bookmarks to come back then. Hi, Neat post. There’s an issue along with your site in internet explorer, would check this¡K IE still is the market chief and a huge component of other people will miss your fantastic writing because of this problem. What i don’t realize is actually how you’re not really a lot more well-liked than you may be right now. You are so intelligent. You already know therefore significantly when it comes to this subject, produced me personally consider it from numerous numerous angles. Its like men and women aren’t involved until it¡¦s one thing to accomplish with Woman gaga! Your own stuffs great. At all times care for it up! hi!,I like your writing very a lot! share we be in contact more about your article on AOL? I need an expert in this area to unravel my problem. Maybe that is you! Having a look ahead to peer you. Hello there. I discovered your website by the use of Google whilst looking for a similar topic, your site got here up. It appears great. I’ve bookmarked it in my google bookmarks to visit then. Hey there. I discovered your site via Google even as looking for a comparable topic, your site came up. It appears great. I’ve bookmarked it in my google bookmarks to come back then. I was just seeking this information for a while. After 6 hours of continuous Googleing, finally I got it in your web site. I wonder what’s the lack of Google strategy that don’t rank this kind of informative sites in top of the list. Generally the top web sites are full of garbage. Hi there. I discovered your blog by the use of Google even as looking for a related subject, your site came up. It seems good. I have bookmarked it in my google bookmarks to visit then. Hey there. I discovered your site by means of Google at the same time as looking for a related topic, your site got here up. It appears good. I’ve bookmarked it in my google bookmarks to come back then. Hiya, I’m really glad I’ve found this info. Today bloggers publish just about gossip and web stuff and this is actually frustrating. A good website with exciting content, that’s what I need. Thank you for making this web-site, and I’ll be visiting again. Do you do newsletters by email? Hiya, I’m really glad I’ve found this info. Nowadays bloggers publish just about gossip and net stuff and this is actually annoying. A good website with exciting content, that is what I need. Thanks for making this website, and I will be visiting again. Do you do newsletters by email? Hiya, I’m really glad I have found this information. Today bloggers publish only about gossip and web stuff and this is actually annoying. A good site with interesting content, that’s what I need. Thank you for making this site, and I’ll be visiting again. Do you do newsletters by email? Hello there. I found your website by the use of Google whilst searching for a similar matter, your web site came up. It seems to be great. I’ve bookmarked it in my google bookmarks to visit then. Hey there. I discovered your website by the use of Google whilst looking for a similar topic, your web site got here up. It looks good. I’ve bookmarked it in my google bookmarks to visit then. Hey there. I discovered your website by the use of Google while searching for a related topic, your website got here up. It appears to be good. I have bookmarked it in my google bookmarks to visit then. Hey there. I found your website via Google even as searching for a related subject, your site got here up. It seems to be good. I’ve bookmarked it in my google bookmarks to come back then. Hi there. I found your website via Google while searching for a related matter, your website came up. It appears good. I have bookmarked it in my google bookmarks to come back then. Hiya, I’m really glad I’ve found this information. Nowadays bloggers publish just about gossip and web stuff and this is really irritating. A good blog with exciting content, this is what I need. Thanks for making this web-site, and I will be visiting again. Do you do newsletters by email? Hi there. I found your site by way of Google even as looking for a comparable subject, your web site came up. It seems good. I have bookmarked it in my google bookmarks to come back then. Hiya, I am really glad I have found this information. Today bloggers publish only about gossip and internet stuff and this is actually irritating. A good blog with exciting content, this is what I need. Thanks for making this site, and I’ll be visiting again. Do you do newsletters by email? Hey there. I found your website via Google whilst searching for a similar topic, your website got here up. It appears to be good. I’ve bookmarked it in my google bookmarks to visit then. Hiya, I’m really glad I’ve found this information. Nowadays bloggers publish only about gossip and internet stuff and this is actually annoying. A good site with exciting content, this is what I need. Thank you for making this site, and I will be visiting again. Do you do newsletters by email? Hey there. I discovered your website by the use of Google whilst looking for a similar matter, your website came up. It seems to be great. I have bookmarked it in my google bookmarks to visit then. Hi there. I discovered your site via Google at the same time as looking for a related subject, your site got here up. It appears to be good. I have bookmarked it in my google bookmarks to visit then. Hi there. I found your website via Google whilst looking for a related matter, your web site came up. It appears great. I have bookmarked it in my google bookmarks to visit then. Hiya, I am really glad I’ve found this information. Nowadays bloggers publish only about gossip and net stuff and this is actually frustrating. A good site with exciting content, that’s what I need. Thank you for making this web site, and I will be visiting again. Do you do newsletters by email? Hey there. I found your blog by way of Google at the same time as searching for a related topic, your site got here up. It seems to be good. I have bookmarked it in my google bookmarks to come back then. Hiya, I am really glad I’ve found this info. Today bloggers publish just about gossip and web stuff and this is really irritating. A good site with interesting content, that is what I need. Thank you for making this website, and I’ll be visiting again. Do you do newsletters by email? Hiya, I’m really glad I have found this information. Nowadays bloggers publish only about gossip and web stuff and this is actually annoying. A good web site with exciting content, that is what I need. Thanks for making this web site, and I’ll be visiting again. Do you do newsletters by email? Wonderful goods from you, man. I’ve understand your stuff previous to and you are just extremely great. I actually like what you have acquired here, certainly like what you’re stating and the way in which you say it. You make it enjoyable and you still care for to keep it wise. I cant wait to read far more from you. This is actually a wonderful web site. Hi there. I discovered your web site by way of Google while looking for a comparable topic, your site came up. It looks good. I’ve bookmarked it in my google bookmarks to visit then. Hello there. I discovered your website by means of Google at the same time as searching for a similar matter, your website came up. It seems to be good. I’ve bookmarked it in my google bookmarks to visit then. Hiya, I am really glad I’ve found this info. Today bloggers publish only about gossip and net stuff and this is actually annoying. A good site with exciting content, this is what I need. Thank you for making this site, and I will be visiting again. Do you do newsletters by email? Hey there. I discovered your blog by the use of Google whilst looking for a comparable matter, your site got here up. It seems great. I’ve bookmarked it in my google bookmarks to come back then. Hello there. I discovered your website by the use of Google whilst looking for a comparable subject, your website came up. It looks great. I have bookmarked it in my google bookmarks to visit then. Hi there. I found your blog by means of Google at the same time as looking for a similar topic, your website got here up. It seems great. I have bookmarked it in my google bookmarks to visit then. Greetings from Colorado! I’m bored at work so I decided to browse your blog on my iphone during lunch break. I enjoy the information you provide here and can’t wait to take a look when I get home. I’m amazed at how quick your blog loaded on my cell phone .. I’m not even using WIFI, just 3G .. Anyways, fantastic site! Hello there. I found your web site by means of Google whilst searching for a comparable topic, your web site got here up. It looks good. I have bookmarked it in my google bookmarks to visit then. Hey there. I found your web site by means of Google while searching for a related subject, your website came up. It appears good. I’ve bookmarked it in my google bookmarks to come back then. Hey there would you mind letting me know which web host you’re using? I’ve loaded your blog in 3 completely different web browsers and I must say this blog loads a lot quicker then most. Can you recommend a good internet hosting provider at a fair price? Thanks a lot, I appreciate it! Hiya, I am really glad I have found this info. Today bloggers publish only about gossip and web stuff and this is actually frustrating. A good blog with interesting content, that’s what I need. Thank you for making this website, and I’ll be visiting again. Do you do newsletters by email? I and my buddies ended up going through the excellent techniques from your website then suddenly I had a horrible suspicion I had not expressed respect to the blog owner for those techniques. All the boys happened to be consequently thrilled to see all of them and have in effect definitely been using those things. I appreciate you for being so considerate as well as for having this kind of fabulous things millions of individuals are really desperate to know about. Our own honest regret for not expressing gratitude to earlier. Hi there. I found your website by means of Google even as searching for a related matter, your website came up. It seems great. I’ve bookmarked it in my google bookmarks to visit then. Hi there. I found your blog by way of Google whilst looking for a related subject, your website got here up. It appears to be good. I have bookmarked it in my google bookmarks to visit then. Hi there. I found your web site via Google at the same time as searching for a related topic, your website got here up. It seems to be good. I have bookmarked it in my google bookmarks to come back then. Hello there. I discovered your blog by means of Google at the same time as looking for a similar topic, your web site got here up. It seems good. I’ve bookmarked it in my google bookmarks to visit then. Hello there. I found your website by means of Google whilst looking for a comparable subject, your web site got here up. It seems good. I have bookmarked it in my google bookmarks to come back then. Hiya, I’m really glad I have found this information. Today bloggers publish just about gossip and internet stuff and this is actually annoying. A good site with exciting content, that is what I need. Thank you for making this web site, and I will be visiting again. Do you do newsletters by email? Hey there. I discovered your blog by means of Google while searching for a comparable topic, your site got here up. It appears to be great. I have bookmarked it in my google bookmarks to visit then. I do enjoy the manner in which you have presented this specific difficulty plus it really does provide me some fodder for thought. However, through what precisely I have experienced, I basically wish when the reviews pack on that men and women continue to be on point and don’t embark upon a tirade associated with some other news du jour. Still, thank you for this excellent point and whilst I can not necessarily go along with it in totality, I value your perspective. Hello there. I found your website by means of Google whilst searching for a related matter, your website came up. It looks great. I’ve bookmarked it in my google bookmarks to come back then. Hiya, I’m really glad I have found this info. Today bloggers publish only about gossip and net stuff and this is actually frustrating. A good blog with exciting content, that is what I need. Thank you for making this web-site, and I will be visiting again. Do you do newsletters by email? Good ¡V I should certainly pronounce, impressed with your web site. I had no trouble navigating through all the tabs and related info ended up being truly easy to do to access. I recently found what I hoped for before you know it in the least. Quite unusual. Is likely to appreciate it for those who add forums or something, website theme . a tones way for your customer to communicate. Nice task..
wonderful post, very informative. I wonder why the other experts of this sector don’t understand this. You must proceed your writing. I’m sure, you’ve a huge readers’ base already! Hiya, I am really glad I have found this info. Nowadays bloggers publish just about gossip and net stuff and this is actually frustrating. A good site with interesting content, this is what I need. Thank you for making this website, and I’ll be visiting again. Do you do newsletters by email? Hi there. I found your website by way of Google whilst searching for a related topic, your site came up. It appears to be great. I’ve bookmarked it in my google bookmarks to visit then. Hiya, I am really glad I have found this info. Today bloggers publish only about gossip and internet stuff and this is really irritating. A good site with exciting content, that’s what I need. Thanks for making this web-site, and I will be visiting again. Do you do newsletters by email? Hello there. I found your web site by way of Google whilst searching for a comparable subject, your site got here up. It appears good. I have bookmarked it in my google bookmarks to visit then. Hiya, I am really glad I’ve found this information. Nowadays bloggers publish only about gossip and web stuff and this is really annoying. A good blog with interesting content, that is what I need. Thank you for making this web-site, and I will be visiting again. Do you do newsletters by email? Hello there. I discovered your web site by the use of Google even as searching for a comparable matter, your site got here up. It seems good. I have bookmarked it in my google bookmarks to visit then. Hey there. I found your site via Google even as searching for a related subject, your site got here up. It looks good. I have bookmarked it in my google bookmarks to come back then. Hello there. I discovered your web site by the use of Google whilst looking for a related matter, your web site got here up. It seems to be good. I have bookmarked it in my google bookmarks to visit then. Hiya, I’m really glad I have found this info. Nowadays bloggers publish just about gossip and internet stuff and this is actually annoying. A good website with exciting content, that is what I need. Thanks for making this web-site, and I will be visiting again. Do you do newsletters by email? Hey there. I found your website via Google while searching for a comparable subject, your web site came up. It looks great. I’ve bookmarked it in my google bookmarks to visit then. Hiya, I am really glad I’ve found this info. Nowadays bloggers publish just about gossip and net stuff and this is really irritating. A good site with exciting content, that’s what I need. Thanks for making this web-site, and I will be visiting again. Do you do newsletters by email? Hello there. I found your site by means of Google whilst looking for a comparable subject, your web site came up. It appears to be good. I’ve bookmarked it in my google bookmarks to visit then. Hello there. I found your site by means of Google while looking for a related topic, your web site got here up. It seems great. I have bookmarked it in my google bookmarks to come back then. Hi there. I discovered your site by the use of Google even as searching for a related topic, your web site got here up. It appears to be great. I’ve bookmarked it in my google bookmarks to visit then. Hello there. I found your blog by the use of Google while looking for a similar matter, your website got here up. It appears good. I have bookmarked it in my google bookmarks to visit then. Hiya, I’m really glad I’ve found this information. Nowadays bloggers publish just about gossip and net stuff and this is actually annoying. A good web site with exciting content, that is what I need. Thanks for making this site, and I will be visiting again. Do you do newsletters by email? Hello there. I discovered your site by way of Google whilst looking for a similar subject, your web site came up. It seems great. I have bookmarked it in my google bookmarks to come back then. Hiya, I am really glad I’ve found this information. Today bloggers publish only about gossip and internet stuff and this is really frustrating. A good blog with exciting content, this is what I need. Thank you for making this web-site, and I’ll be visiting again. Do you do newsletters by email? Hiya, I’m really glad I have found this information. Today bloggers publish just about gossip and net stuff and this is actually annoying. A good site with exciting content, that’s what I need. Thanks for making this website, and I will be visiting again. Do you do newsletters by email? Hiya, I am really glad I’ve found this information. Nowadays bloggers publish just about gossip and net stuff and this is actually irritating. A good blog with interesting content, this is what I need. Thank you for making this web-site, and I will be visiting again. Do you do newsletters by email? Hiya, I am really glad I have found this information. Nowadays bloggers publish only about gossip and net stuff and this is really annoying. A good site with exciting content, this is what I need. Thanks for making this site, and I will be visiting again. Do you do newsletters by email? Hiya, I am really glad I’ve found this information. Today bloggers publish just about gossip and internet stuff and this is really irritating. A good website with exciting content, this is what I need. Thank you for making this web-site, and I’ll be visiting again. Do you do newsletters by email? Hiya, I’m really glad I’ve found this information. Today bloggers publish just about gossip and web stuff and this is really irritating. A good website with exciting content, that’s what I need. Thanks for making this website, and I will be visiting again. Do you do newsletters by email? Hi there. I discovered your blog by the use of Google while searching for a similar subject, your website came up. It appears good. I have bookmarked it in my google bookmarks to come back then. Hi there. I discovered your web site by way of Google whilst looking for a related matter, your website came up. It seems great. I’ve bookmarked it in my google bookmarks to come back then. Hello there. I discovered your site by the use of Google while looking for a similar matter, your web site came up. It seems to be good. I’ve bookmarked it in my google bookmarks to visit then. Hiya, I am really glad I’ve found this information. Today bloggers publish just about gossip and net stuff and this is actually frustrating. A good site with exciting content, this is what I need. Thanks for making this website, and I’ll be visiting again. Do you do newsletters by email? Hi there. I discovered your website via Google even as searching for a related topic, your site got here up. It looks good. I’ve bookmarked it in my google bookmarks to come back then. Hiya, I am really glad I have found this information. Nowadays bloggers publish only about gossip and web stuff and this is actually frustrating. A good website with interesting content, this is what I need. Thanks for making this web site, and I’ll be visiting again. Do you do newsletters by email? I will start a blog. In addition to many other hopeful’s, I intend to eventually generate income off it. I observed a lot of sites do not enable you to make money of google advertisement feeling and things like that. What are some sites I can begin my blog on that will allow this since it seems to be one of the most profitable method to generate income off a blog?. Hiya, I am really glad I’ve found this info. Nowadays bloggers publish only about gossip and internet stuff and this is actually frustrating. A good website with exciting content, this is what I need. Thank you for making this website, and I’ll be visiting again. Do you do newsletters by email? Do you blog? Do you blog site to market things you are offering? I am rather brand-new to the blog writing world. I mainly blog site to market items that I am marketing and also sites that I am marketing on. Exactly how do I obtain web traffic to my blog? Do I generally just require to include material? Does my blog get picked up in the search? Any recommendations on blogging is significantly required. Hello there, yes I discuss it on my twitter account as well as likewise my other web-sites. Hi there. I found your web site via Google even as looking for a comparable matter, your website got here up. It seems to be good. I have bookmarked it in my google bookmarks to come back then. Hello there. I found your site via Google even as searching for a comparable topic, your web site came up. It seems good. I’ve bookmarked it in my google bookmarks to come back then. Hello there. I found your site via Google at the same time as searching for a similar matter, your website got here up. It appears to be good. I’ve bookmarked it in my google bookmarks to come back then. Hiya, I’m really glad I’ve found this information. Nowadays bloggers publish just about gossip and web stuff and this is really frustrating. A good web site with exciting content, that is what I need. Thanks for making this website, and I will be visiting again. Do you do newsletters by email? Hiya, I am really glad I have found this information. Nowadays bloggers publish just about gossip and net stuff and this is actually annoying. A good website with exciting content, that’s what I need. Thanks for making this web site, and I’ll be visiting again. Do you do newsletters by email? Hiya, I’m really glad I’ve found this information. Nowadays bloggers publish just about gossip and internet stuff and this is actually irritating. A good website with interesting content, this is what I need. Thank you for making this web site, and I will be visiting again. Do you do newsletters by email? Hiya, I’m really glad I have found this information. Today bloggers publish just about gossip and net stuff and this is really annoying. A good site with exciting content, this is what I need. Thanks for making this site, and I’ll be visiting again. Do you do newsletters by email? Hey there. I discovered your site by means of Google whilst searching for a similar subject, your site got here up. It appears to be good. I’ve bookmarked it in my google bookmarks to visit then. Hiya, I’m really glad I’ve found this info. Today bloggers publish just about gossip and internet stuff and this is really annoying. A good blog with interesting content, this is what I need. Thanks for making this web site, and I’ll be visiting again. Do you do newsletters by email? Great website. Plenty of useful information here. I am sending it to some pals ans additionally sharing in delicious. And naturally, thanks for your effort! Hello, Neat post. There’s an issue together with your website in web explorer, could check this¡K IE nonetheless is the marketplace leader and a big component of folks will miss your great writing because of this problem. Hi there. I found your web site by way of Google while searching for a related topic, your website got here up. It seems to be great. I have bookmarked it in my google bookmarks to visit then. Hi there. I discovered your blog by the use of Google even as looking for a comparable subject, your website came up. It appears good. I’ve bookmarked it in my google bookmarks to visit then. Hiya, I am really glad I’ve found this information. Nowadays bloggers publish just about gossip and web stuff and this is really frustrating. A good blog with exciting content, that is what I need. Thank you for making this site, and I’ll be visiting again. Do you do newsletters by email? Hey there. I discovered your site by the use of Google even as searching for a comparable matter, your website got here up. It seems to be good. I have bookmarked it in my google bookmarks to come back then. Hey there. I discovered your blog by means of Google whilst searching for a similar matter, your web site got here up. It seems good. I have bookmarked it in my google bookmarks to come back then. Hiya, I am really glad I’ve found this info. Nowadays bloggers publish just about gossip and net stuff and this is really annoying. A good web site with exciting content, that is what I need. Thanks for making this web-site, and I’ll be visiting again. Do you do newsletters by email? Hello there. I found your web site via Google while searching for a related topic, your web site came up. It appears to be good. I have bookmarked it in my google bookmarks to visit then. Hiya, I’m really glad I’ve found this info. Nowadays bloggers publish only about gossip and internet stuff and this is actually irritating. A good site with exciting content, that is what I need. Thank you for making this web-site, and I will be visiting again. Do you do newsletters by email? Hey there. I discovered your website by means of Google while looking for a related matter, your website came up. It seems good. I have bookmarked it in my google bookmarks to visit then. Hiya, I am really glad I’ve found this information. Nowadays bloggers publish only about gossip and net stuff and this is actually frustrating. A good website with exciting content, that is what I need. Thank you for making this web-site, and I’ll be visiting again. Do you do newsletters by email? Hi there. I discovered your site by way of Google even as looking for a comparable topic, your site came up. It appears good. I’ve bookmarked it in my google bookmarks to visit then. Hello there. I discovered your website via Google at the same time as searching for a related matter, your website came up. It looks good. I have bookmarked it in my google bookmarks to visit then. Hiya, I am really glad I have found this info. Today bloggers publish just about gossip and net stuff and this is actually frustrating. A good website with exciting content, that is what I need. Thank you for making this web site, and I will be visiting again. Do you do newsletters by email? Hiya, I am really glad I’ve found this information. Nowadays bloggers publish only about gossip and internet stuff and this is really frustrating. A good blog with exciting content, this is what I need. Thanks for making this site, and I will be visiting again. Do you do newsletters by email? Hi there. I discovered your blog by means of Google at the same time as searching for a comparable matter, your web site came up. It appears to be good. I’ve bookmarked it in my google bookmarks to come back then. Hey there. I found your web site by way of Google at the same time as looking for a similar subject, your website came up. It seems to be great. I have bookmarked it in my google bookmarks to come back then. Hiya, I am really glad I have found this information. Today bloggers publish just about gossip and net stuff and this is really frustrating. A good blog with interesting content, that is what I need. Thanks for making this web-site, and I will be visiting again. Do you do newsletters by email? Hi there. I found your site by means of Google whilst looking for a related topic, your web site came up. It appears to be good. I have bookmarked it in my google bookmarks to visit then. Hiya, I’m really glad I’ve found this information. Nowadays bloggers publish only about gossip and web stuff and this is actually irritating. A good website with interesting content, this is what I need. Thank you for making this web site, and I will be visiting again. Do you do newsletters by email? Hey there. I found your website by way of Google while searching for a similar subject, your website came up. It seems good. I’ve bookmarked it in my google bookmarks to visit then. Hiya, I’m really glad I have found this information. Today bloggers publish only about gossip and internet stuff and this is really frustrating. A good blog with exciting content, that’s what I need. Thanks for making this web site, and I will be visiting again. Do you do newsletters by email? Hey there. I discovered your website by way of Google while looking for a related topic, your website came up. It appears to be great. I’ve bookmarked it in my google bookmarks to come back then. Hello.This post was really motivating, especially because I was looking for thoughts on this subject last Thursday. Hi there. I found your blog by means of Google at the same time as searching for a comparable matter, your site came up. It seems good. I’ve bookmarked it in my google bookmarks to visit then. Hiya, I am really glad I’ve found this information. Today bloggers publish only about gossip and web stuff and this is really frustrating. A good website with interesting content, that is what I need. Thank you for making this website, and I will be visiting again. Do you do newsletters by email? find it very bothersome to inform the reality nevertheless I will surely come again again. Hello there. I discovered your site by way of Google at the same time as searching for a related subject, your site came up. It appears to be great. I’ve bookmarked it in my google bookmarks to come back then. Hey there. I found your web site by the use of Google whilst searching for a related topic, your website got here up. It looks great. I have bookmarked it in my google bookmarks to come back then. Hi there. I found your site by means of Google at the same time as searching for a related subject, your website came up. It seems great. I’ve bookmarked it in my google bookmarks to visit then. Hi there. I discovered your blog via Google while looking for a similar matter, your website came up. It appears great. I have bookmarked it in my google bookmarks to visit then. Hiya, I am really glad I have found this info. Today bloggers publish only about gossip and web stuff and this is actually frustrating. A good web site with interesting content, this is what I need. Thanks for making this web site, and I’ll be visiting again. Do you do newsletters by email? Hey there. I found your website by way of Google at the same time as looking for a similar subject, your website came up. It looks good. I’ve bookmarked it in my google bookmarks to visit then. Hiya, I’m really glad I have found this info. Today bloggers publish just about gossip and web stuff and this is really irritating. A good site with exciting content, that is what I need. Thanks for making this web-site, and I will be visiting again. Do you do newsletters by email? Hey there. I found your website by the use of Google while searching for a related topic, your website came up. It appears to be great. I’ve bookmarked it in my google bookmarks to come back then. Hi there. I found your site via Google whilst searching for a similar matter, your site came up. It seems great. I’ve bookmarked it in my google bookmarks to come back then. Hiya, I am really glad I’ve found this info. Nowadays bloggers publish just about gossip and web stuff and this is actually frustrating. A good web site with exciting content, that’s what I need. Thanks for making this web site, and I’ll be visiting again. Do you do newsletters by email?